Read all 4 wanderers, can’t wait to read the last one. Read your first wanderer book, liked the story and your writing style so just got the other three. I think giving away the first book was a good marketing strategy as you get a taste of the story and your writing style. I would have never purchased your books otherwise, as I always purchase recommended books by friends I trust or books whose authors I am familiar with. I too received the first Wanderer as a free Nook special and quickly snapped up the remaining three! Love it and axiously await the finale. Is there a way we can receive an email once it is available or do you know of an approximate timeframe that I can check back for it? During my wait I have also purchased The Last Sunrise and other short stories. Loved them too! So glad you enjoyed them all. If you sign up for the newsletter here http://www.simongoodson.com/subscribe/ then you’ll be notified when the new book is ready for pre-order and again when its out. 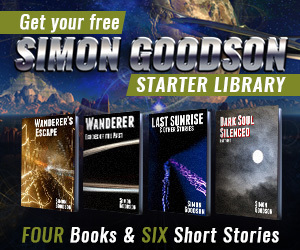 You’ll also get access to four free books (though you have Wanderer 1 and 2, but still 2 new free books) and six free short stories. And it sounds like I need to continue with my re-design of the site if it took you a while to find the progress tab. Were you looking on a mobile device or desktop computer? When will wander book be out in 2016 ? At the moment it’s looking like it’ll be near the end of the year but it’s hard to say for sure. It’s turning into a monster of a book, already significantly longer than the first two in the series and probably only halfway done. Great to hear you’ve enjoyed them all so much. Hopefully the next book (a short story collection) will complete the editing stage soon and I can put a release date in for it, and Wanderer book 5 has just passed 150,000 words so it’s going to be a real beast when it’s finished. Been reading the first 4 books of the Wanderer! Really love them. I thought this was an email comment and haven’t been able to find it. Have you checked your spam folder? That tends to be where the emails go if they don’t turn up. If it’s not there please contact me via the contact form in the menu bar and I’ll send out the link manually. Thanks Kerry! Luckily the writing helps me get my head (a little) straighter! Hope you enjoy the new book! Thank you for your brilliant books. I’ve thoroughly enjoyed the Wanderer series so far. I keep checking Amazon to see if I can either preorder the fifth book or better still that it’s already out. Unless there are pressing matters I’m guessing it will be a one sit read, because as sure as heck I’m not going anywhere until it’s finished. Just out of curiosity any idea when Wanderer five will be out? Mean while I will enjoy the short stories you are just about to publish. I’ve been a bit slow on the updates lately with so much going on. Wanderer Five is still being written, though I’m definitely near the end. It’s up to 195,000 words now so it’s a real epic! Updates should come up on this blog from time to time, or if you signup to my mailing list you’ll get plenty of warning when the next book is out. I finished your short stories in almost one sitting. That is so say I wondered off to get food and drink and then back to nose in book. Loved the stories especially Fatal Infection. I was determined all the way through the book not to speculate. I just wanted to enjoy the plot twists and I really did. I knew something was coming in Fatal Infection because of what was not mentioned rather than what was. Many thanks. Have a great day on your wedding and wishing you both many years of happiness.